Arlo smart cameras are very neat-looking and give you the opportunity to monitor your home from every angle, inside and out, day and night. You can start out with just one camera, and eventually expand your system to include up to 16 cameras. These cameras feature excellent HD video quality, night vision, and a very clear audio. One of the best things about this system is that it is super easy to set up. It's 100% wireless, so you don't have to plug anything in, making it perfect for anyone lacking a few technical skills. Yet, that’s just the tip of the iceberg. Arlo cameras come with a little magnet mount, making installation extremely easy. The mount can literally be placed anywhere you desire. the cameras are 100% waterproof, making them perfect for either indoor or outdoor use. You also have the option of either accessing the cameras via your mobile phone or computer. With a 130 degree field of view, the cameras deliver 1280 by 720-pixel videos. They also come with a digital pan and zoom functionality so you can zoom in to capture the hidden and unclear spots. A quick start guide: The guide gives you details first about what features the camera systems are composed of. Then you will learn more about the easy installation and connectivity, as well as how to use the mobile phone application. A base station: The hub or base station comes with a loud siren and you can connect it to your router. A rechargeable battery pack: The Lithium-ion batteries will keep your camera systems running for a long time before you have to recharge them. They are designed to last up to six months even with consistent use. This means that you can install your cameras anywhere around your home as you would be worrying less about their charge dying unexpectedly. When the batteries ultimately die, simply unmount the camera from its position and plug it into its power adapter for about two hours. Alternatively, you can opt to purchase the Arlo Pro Charging Station that will charge two batteries at a go in half the time. 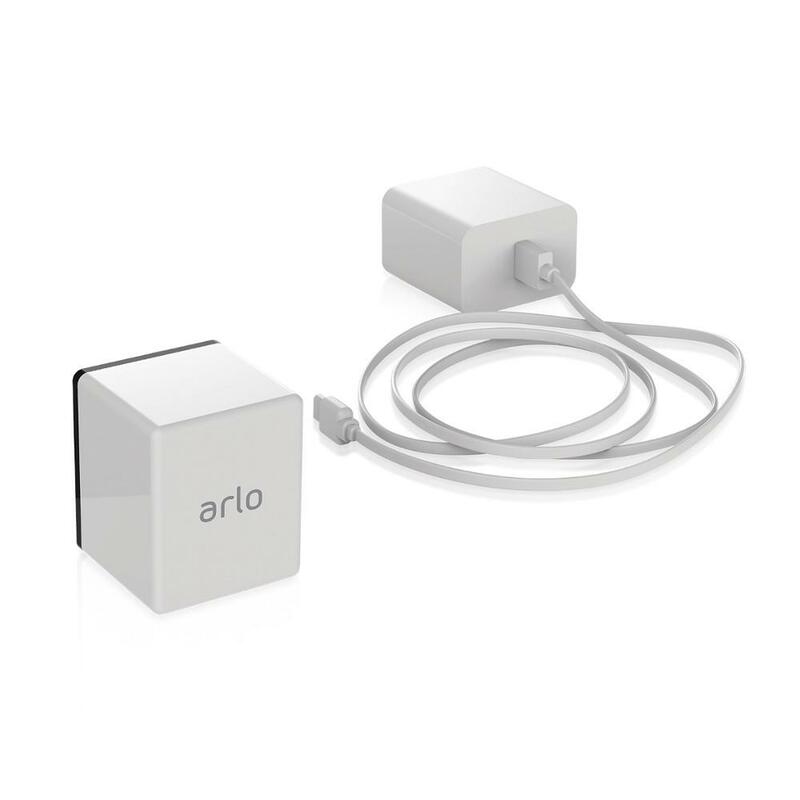 A power cable: The Arlo camera system also comes with a camera power cable which will allow you to use the AC power as an alternative option. This is if you would rather not use the batteries. The cameras each have a mini USB port to which you are supposed to attach the power cable whenever you want to charge. This option is, however, only possible for indoor cameras. Outdoor cameras require special outdoor power adapters. A wall mount and screw set: The Arlo smart security system features a wall mount and the required installation hardware which is the screw set. The wall mount is composed of two magnetic mounts that you will only install in a snap. The strong magnets in the housing will make it easy to attach the cameras to any metal surfaces as well as any other preferred places so you can monitor your home from every possible angle. You can also place them on shelves or countertops, or you can buy another mounting mechanism that you will screw into the back of the camera. Ethernet cable: These camera systems are 100% wireless and completely wire-free. This makes it easy to install them anywhere, inside or outside your home. The Ethernet cable also allows you to connect your cameras to the internet. Two-way communication: The cameras come with a speaker and microphone array to enable a two-way communication and sound detection. This feature lets you hear what is happening around the cameras and you can talk back through your phone from wherever you are. Motion detector: The cameras from Arlo each have a motion detector which will automatically initiate recording whenever any motion is detected. Then you can watch the videos of all the suspicious activity that might have happened while you were away from home. Arlo also features a security light as an additional security system that you can choose to purchase separately. The security light is completely wire-free, and so you can also install it anywhere around your home. The light will not only attract your eyes but also your ears. You will be immediately alerted in case of any possible intrusion. You can pair it with the security cameras or it can still work intelligently by itself. It is highly customizable, weather resistant and has very flexible power options. The Arlo camera systems come with an App that allows you to remotely access your cameras, get notifications, personalize changes or watch videos from your mobile phone or computer. For smartphones, the App is compatible with Android or iOS. The base station is compact and measures 6.5 by 8.5 by 2.3 inches. It has a Sync button up top for pairing cameras, whereas on the front it has LED indicators for camera connectivity, internet, and power. At the back of the hub are two USB ports, a power jack, a LAN port, a reset, and power button. To enable external storage, you will attach a USB drive to one of the USB ports. There is a 100db siren inside the base station which you can program to go off when sound or motion is detected. The main page of the Arlo App will display every camera you have installed, each with a snapshot of its last captured image. Each of the cameras will show you a WI-FI signal meter, a battery level meter, a settings icon and another icon to tell you if motion detection is enabled. In the middle of each camera image is a play button that will initiate a live video feed. At the bottom of the page are other icons for Mode, Library, Devices, and Settings. Tap the Mode icon to arm or disarm motion and sound detection, enable alert notifications, or create your own rules for recording triggered events. The Library icon will give access to a list of recorded video and snapshots which you can view, share or delete. When you click on the Settings icon, you will view your account details and you can even grant access to the camera systems to other family members and friends. Everything considered, this is another brilliant home security solution from Netgear! 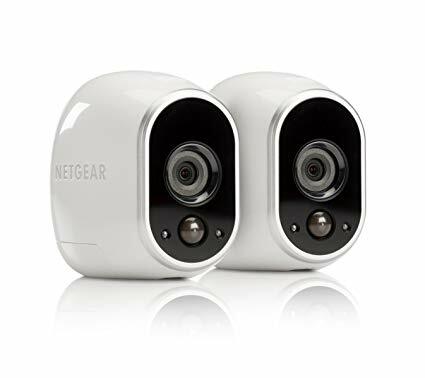 The camera system comes with amazing features, allowing you to monitor events all around your entire household and neighborhood both during the day and at night. This is a simple DIY home security system definitely worth buying!